The knowledge and expertise of Hilton-Baird Audit & Survey’s Directors has been recognised by a series of prestigious awards over the years. 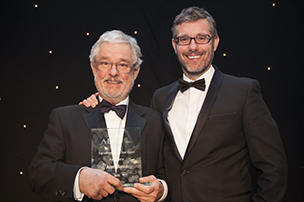 For the second time in four years, Director Alan Baird was voted Lecturer of the Year at the annual ABFA Achievers’ Awards dinner. Here he is celebrating his achievement with his son, and co-founder of the Hilton-Baird Group, Alex Hilton-Baird. 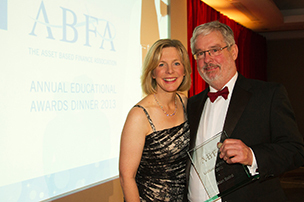 Director and founder of Hilton-Baird Audit & Survey was voted Lecturer of the Year at the ABFA Educational Awards, in recognition of his outstanding work in delivering the annual ABFA Audit & Survey Training course to auditors and business analysts across the ABL sector. Hilton-Baird Audit & Survey has been running the course since 2008. Here he is collecting his award from BBC Sport presenter, Hazel Irvine. The contribution and expertise of CEO of the Hilton-Baird Group, Alex Hilton-Baird, was recognised by his inclusion in Finance Monthly magazine’s Leading Advisor 100 list. This exclusive list acknowledges the achievements of leading advisors and businesses from across the world and covers specialists from the likes of corporate finance, financial advisory and insolvency & restructuring.